The back story is completely absurd. Apparently, one day storm clouds decided to fall over the nation of Malaria, and then refused to go away. The residents of Malaria are kinda bummed, not just because they live in a placed called "Malaria", but also because this constant storming destroyed their crops, which is their main export and pretty much only source of income. Luckily, someone stepped up to the plate to turn things around... not by getting rid of the storm clouds, but by convincing the people of Malaria to become evil, to build evil inventions so that they could hold the rest of the world hostage. Uh... okay... and if you think that's kinda weird, well... everybody actually goes along with it! So every year now a contest is held, kinda like a science fair but for evil inventions, and the winning evil invention will be chosen to be the one that holds the world hostage... uh... should I even point out everything that is worth with this whole scenario? How many evil inventions does it take, anyway? So what, each year the rest of the world discovers how to defeat the previous invention, thus requiring another one? And nobody ever thinks just to bomb the hell out of Malaria? Apparently not, because the movie continues. In this backwards Addams Family-like society, everyone loves evil, and the evil mad scientists are hard at work on their inventions. Each of these mad scientists has a hunchback assistant which does nothing more than pull a switch... or at least that's all they're supposed to do. That's where our main character, Igor, comes in. 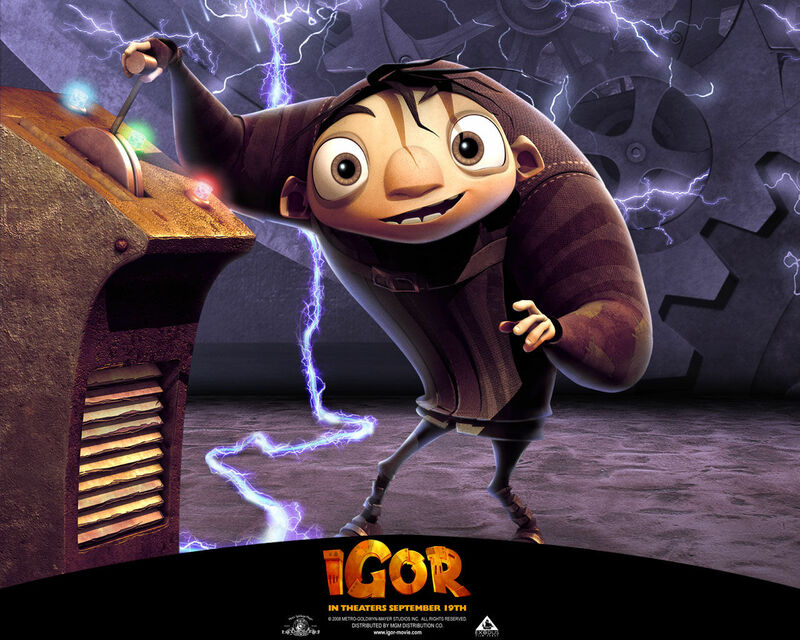 His mad scientist, Doctor Glickenstein, is hopelessly unskilled, while Igor is a magnificent inventor. 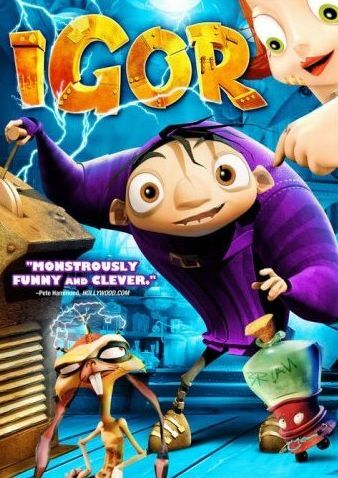 So when Doctor Glickenstein accidentally kills himself, Igor decides to take it upon himself to build an evil invention. What he comes up with is a rather large Frankenstien-like creature with one large arm, one small arm, and a doll-like head. There's just one problem... she's not evil. He put a single evil bone in Eve's body, but it did not activate, so now he tries to jump start it by having her do something evil... which she won't do, because she's good and kind hearted. So then he takes her to a place which is supposed to brainwash her into being evil, but an accident occurs and she is instead brainwashed into being an actress. None of this stuff was all that funny, and I didn't feel any chemistry between Igor and Eve. There is also a subplot about another supposedly great evil scientist who will do whatever it takes to win, but I really didn't care about that either. What I did like was Scamper, a rabbit friend of Igors that wants nothing more than to die, but can't because of an invention Igor made which prevents this. 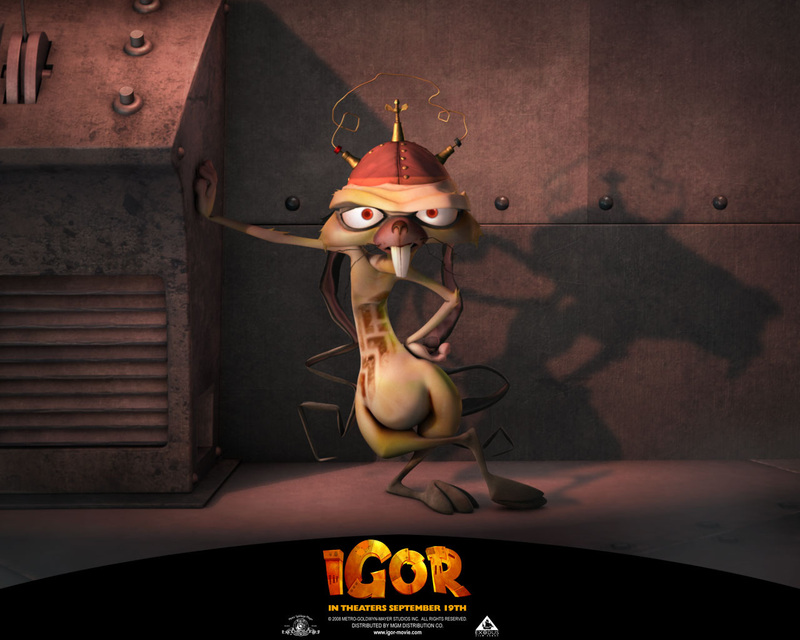 Voiced by Steve Buscemi, the character is a perfect match to Buscemi's voice and comedy style. He's pretty much the only thing that made me laugh in the film. 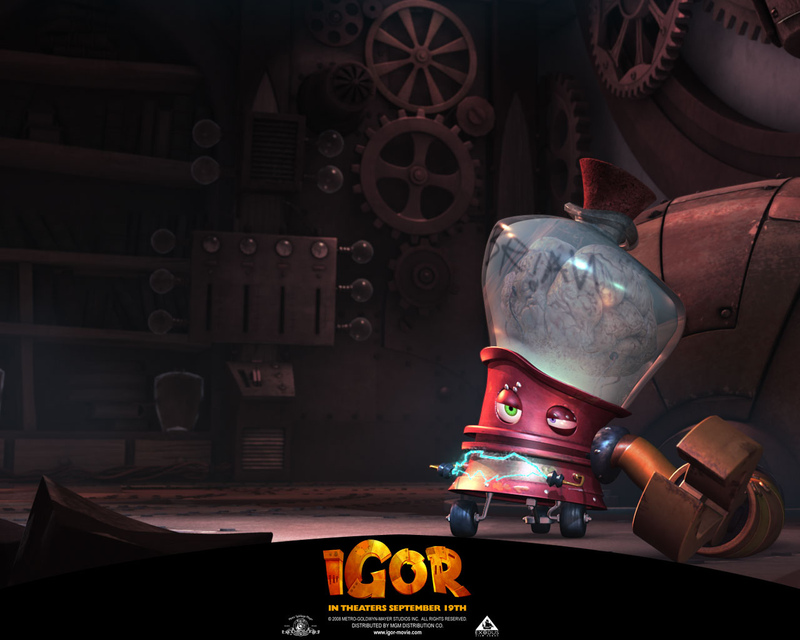 Well, Igor's other pal, a brain in a jar who is anything but intelligent, also made me chuckle a few times, but that's about it. The rest of this movie is mildly sweet, but easily forgettable. As for the DVD, special features are scarce. There's an audio commentary with the three people, the director, writer, and producer, plus an alternate opening scene, and then some concept art. So nothing really worth getting the DVD for. Might as well wait for it to come out on television.